Matt offers us some inside knowledge of his secrets to a successful business proposal, including what you should be asking and what you shouldn’t be doing. You write a marketing advice blog and have written a successful guide to business proposal development. What led you to this path? Matt Handal: First off, thank you for reaching out to me. I have a lot of respect for those trying to help people put business proposals together more efficiently. My background is marketing in the architecture, engineering, and construction industry. Obviously, that’s a big industry that submits a lot of business proposals. As an individual, I’ve been fortunate — or unfortunate — enough to have submitted proposals to government agencies in every state and overseas. I’ve submitted proposals to the Federal government, state governments, municipalities, and Fortune 500 companies. I’ve been very lucky in that I’ve had some pretty frank conversations with procurement people and decisions makers. And I’ve been allowed in to procurements to observe as a “fly on the wall.” So, I got to see and hear the reality of the procurement process vs. what your clients will tell you about it. Besides advising entrepreneurs and big business on how to create great business proposals, what’s your day job? Matt: I’m not a consultant, I’m an in-house practitioner. An in-house practitioner is someone who writes proposals or manages the proposal process for a company as a full-time employee. What people don’t understand is we have extremely stressful jobs. Many work long hours. And unlike dentistry or hotel management, nobody has a degree in proposal coordination. You get thrown into a very complex and stressful world with no training. OK, then why take the time to write a book about it? 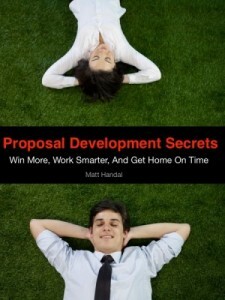 Matt: I wrote Proposal Development Secrets to help those who coordinate the business proposal efforts. And yes, they often write portions of proposals…but it is much more than that. It has several sections on writing. But it’s different than other books out there because of who it was written for…those in the trenches. My goal was to make their lives easier. Can you share a couple of your secrets with Quote Roller? Environmental awareness is big with clients in our industry (and others). You can create a 100% recyclable proposal. What’s the most important part of a business proposal? Matt: Well, all proposals are sales proposals. You are always trying to get someone to take the action you want them to take. My biggest and most important proposal win was after I put a ring under some girl’s pillow. She found it while making the bed. She got the message and she said, “yes.” [awww.] So, message trumps everything. Even if someone has a lower price, the right message will get you the contract. What is the least important part of a business proposal? Matt: A lot of people spend too much time worrying about what I call “bug dust.” People will spent too much time making sure the proposal has every comma in the right place. But in reality, if your clients spends more than 10 minutes reading your proposal, you just won the proposal lottery. Nobody will notice or care about a comma. That time would have been better spent perfecting your message. What is one question you should ask a client or potential client before pitching to them? Matt: Top performers don’t want to know one thing. They want to know everything. Ask everything. At the very least, find out what their desired outcome is and what they think the challenges might be. What is the biggest mistake you can make in a sales proposal? Matt: The absolute biggest mistake you can make is any action (or inaction) that would cause the proposal to be delivered after the proposal deadline. Don’t be late. Any advice in general for small business owners trying to juggle everything but the kitchen sink? Matt: Do only what you are great at and get better people for everything else. You can have a personal assistant for $25 a month. You can hire a graphic designer to design a logo for $200. It’s a different world now. If you need to outsource proposal work, send me an email and I can suggest some people. If you need a web developer or writer, I can suggest some people. Focus on doing what you are great at. Matt: Well, I’m always working on interesting side projects aimed at helping people. I just put up a site called businessletter.co (.com was taken). Email is so prevalent these days. I still write business letters every day, but most people don’t. I put together businessletter.co as a free resource to help people write and format business letters. And of course, I have HelpEverybodyEveryday.com, which is aimed at helping people in my industry improve their marketing.